Launched by drag queens and newscasters, Surrey Hills Radio is the latest community-internet hybrid station to launch. We listened in. Don’t Leave Me This Way/Harold Melvin and the Blue Notes. “Don’t forget our guest talking about her book launch.” I couldn’t make out through the over-talking the name of the book, but I think it’s about cycling in France. “It won’t be a recorded interview, it will be live.” “Her event will be on Friday. When’s it on? Can’t read it. It’s in Reigate anyway.” Eventually they remember her name and say she’ll be on later. “Yesterday, we had a special guest David Munro, the chairman of Surrey County Council, which we’ll air on Friday.” There’s some chat about presenter Dave leaving a tap running and needing to leave the studio before the station floods. “Eddie Floyd born this day in 1937 and still with us. Interesting .. funny when I say interesting, as it’s usually really boring. Some people say he was born in 1935,” he says before he goes. In a cardboard box at home, I have a cassette. The 17 year old me wrote XMAS EVE RADIO FRIMLEY PARK 1985 on it. I think that’s the oldest surviving bit of me on the ‘radio’, if you can call a closed-circuit system through clapped out, earwaxy headphones, radio. My point being, when I was getting into this business, my (probably appalling) efforts were only available to you to hear if you were unfortunate enough to be admitted to hospital. 29 years later, everyone can hear everything. I’ve written before about community radio – and the balance of audience service vs volunteer enrichment. And now spectrum’s becoming scarce, and the gear needed to get “on air” continues to fall in price, we’re seeing a spattering of local, internet-delivered ‘community’ stations. Certainly on this 20 minute listen, there’s evidence of an attempt at content – the council guy, the book woman – even if it’s not exactly being sold to the listener very effectively. I wonder though how many generations more we have to endure those tired old things we all did when we started (thinking back to that 1985 cassette!) Are they a necessary part of the process, the caterpillar before the butterfly? 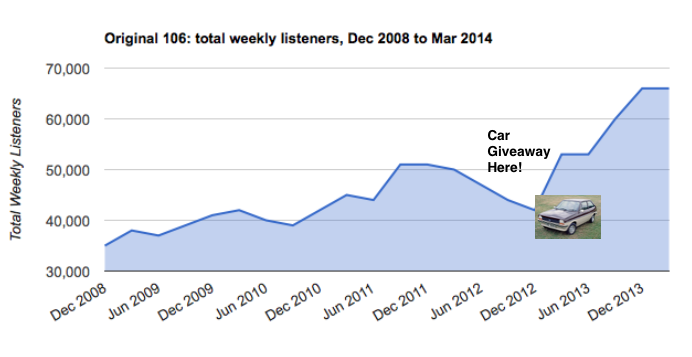 Original 106 in Aberdeen ascribed their audience increases to giving cars away this week. John Myers wasn’t convinced. We listened in to the last outpost of the Original brand. ID: Lunchtime with ITC Hydraulic Services Limited. ID: (sung) Original 106 (tag) Lunchtime with ITC Hydraulic Services Limited. Supporting the offshore, sub-sea and agricultural sectors. Would you change your listening habits on the vague chance of obtaining a Ford Fiesta? Here’s twenty minutes of perfectly serviceable Jack-alike radio. The music’s right, Martin’s friendly and laid-back – if as bloaty as Toto in one link. In a world where the answer to numbing trivia like which film Waiting for a Star to Fall was in is about two clicks away on the phone in your pocket, is it really still strong link fodder? At the very least put us out of our misery and tell us definitively. With some kind of punchline into the vocal. And the much-debated car competition is only on air in ‘The Full Scottish Breakfast” and “The Home Run” (What IS it with these 1982 programme names?!) so is it really responsible for longer hours and higher reach? Surely it’s much more likely that more listeners, listening longer has been achieved on well-programmed music – I’m guessing by Martin, as he’s the PC – and locally relevant content? Meanwhile, Listened In’s campaign for elegantly written S&P continues. Two unusual business-to-business clients in this segment. But do real people, even those in the oil business, talk about ‘sectors’?! So James has told you how they do it. But what does it sound like? We listen in to Absolute Radio’s game-changing genre song splits at Breakfast. 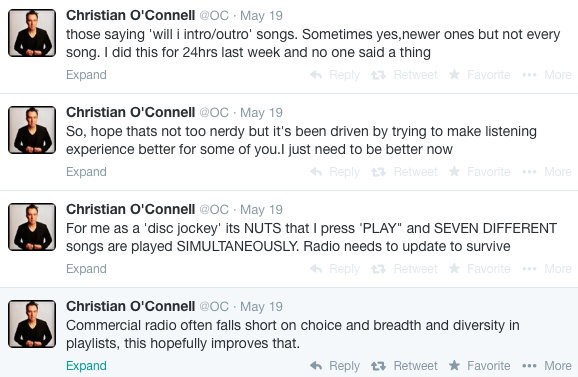 This is NOT a review of Christian, more of the difference this playlist innovation makes. But there’s no doubting from this 20 minutes that he’s at the top of his game. There’s pace, audience connection, laugh-out-loud moments. When someone lives the brand as well as he does, there’s no wonder the station wanted to sort the ‘Kaiser Chiefs on Absolute 80s’ issue. Great to see a brilliant presenter so engaged in a brilliant technical innovation. ADS: McDonalds Breakfast/Chad Valley Aeroplane/Absolute Radio Account (I’m into Something Good – Hermans Hermits on 60s)/European Parliament/Ford/Promo: Soul Time on AR60s. If you love clunkiness, you’ll hate this. It took them a while to do, but Absolute have nailed it, for the greater good of radio. Parking each station’s raison d’être during peak listening always felt wrong – if understandable given you’d want Christian on all your stations. Now you get the best of both worlds. Even when I thought I’d spotted a bug, I looked up the Blink 182 song, and it was released in November 1999, so charted in both decades. Sneaky. And when I heard Living in a Box, I thought “True radio crime if they fade this …” They didn’t. Christian was as tight off the back as he’d have been off vinyl in 1987. The dinosaurs may argue that radio is about shared-experience – and here, you’re not sharing a single experience. True, but the key (live) bit is the stuff around the music, not the music. Even music endorsement looks possible, from the tweets shared above. And although this isn’t true personalisation – yet – it’s another step along that path. Once again, the team at Golden Square are proving they’re the ones who really understand the space where the tech of radio, present and future, meets. The beekeeper in the BBC Breakfast broom cupboard maybe bricking it at the prospect of a smart new competitor – but should radio worry about the Famous-ish Four? There’s a lot of radio thinking – and radio-experienced people – going on in the new Good Morning Britain, so we Listened (Watched?) In. When the music stops ..
Comes off break with sweeping shot across studio against Robbie Williams/Go Gentle. Susanna rounds off with a tease line that Patrick Kielty’s on after 8. The interesting thing if you couldn’t care less about Robbie’s swimmers or Ramsey’s fringe, during the above 5 minutes, the news ticker showed the following top stories: Teacher Stabbing Boy in Custody. 26 Dead in US Storms. Clifford to be sentenced on Friday. Ukraine violence continues. Cancer Survival rates announced. Robbie announces pregnancy. Cancer hero fundraising total hits £3m. Arsenal could get Champions League place. The weather strap, showing percentage chance of rain, temperature and a simple weather symbol, cycled through a staggering 66 different locations in those 5 minutes alone. 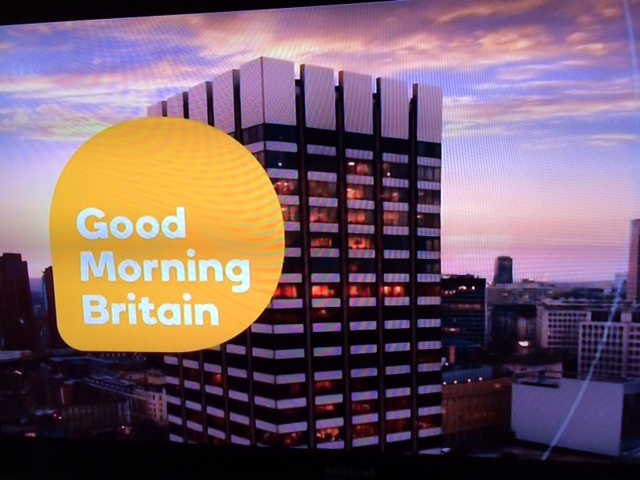 ID: Good Morning Britain, then a pre-recorded Ben Shepherd slightly clunkily introducing the local reader. Here in Granada-land, that’s Sarah Rogers (Twitter-handled on her Aston, and ex Radio Wave, Key 103, Real and Smooth.) She rattles through Saddleworth Reservoir Murder, Hillsborough Inquest, Wigan Toddler drowning, Manchester City breached UEFA Fair Play rules, M60 closure, Local Weather sponsor tag and “Alex with the Local Weather.” “But for now it’s back over to Good Morning Britain.” – as opposed to whatever we’ve been watching the last two minutes? VO: “Tuesday 29th of April 2014. Live from ITV studios in London. THIS. Is Good Morning Britain,” slightly lost in the sound mix. Cleverly, the sky is lighter than an hour before. Gorgeous camera sweep through studio lands on the four-shot at the Biggest Desk In The World. Weather with Laura Tobin (Radio Wales). Who looks like she lost Musical Chairs, sanding in an electric pink dress about a foot lower than the stage but still towering above her seated colleagues. They must be some heels. Who are magically on the sofa area. Which thanks to the mock window behind looks like it’s floating on the actual Thames. Into memory loss girl with her Mum on the sofa. Caption is the subtle GIRL WHO FORGOT HER LIFE. This is so much busier than Kelly and the choirboy. There’s content here, and a lot of boxes ticked. What a story count. And the radio experience of the turns comes through. These junctions are not too shabby for a second day on air, and they can busk better than most news channels. Strong local opting, a good domestic news agenda – and a campy showbiz update. Yes, it’s newsier but look at the structure and script in that top of hour, all the “good to have you with us this morning”s and mid-paragraph name-checking. Recognise that from any other medium? John Simons tweeted that a good zoo format needs good role definition – and by implication that it’s not there yet. But there are early signs, particularly with Ben and Susanna. I stuck around after the designated 20 minutes to see a sodden Andi Peters (Smooth, Heat) doing his cardboard ‘wheel of fortune’ schtick in Saffron Walden – and even he was much improved on Monday’s effort. With a bigger crowd too ..
It’s also a very listenable show. Strange to say with its soaring LWT Tower money shot and the Desk from Outer Space, but the number of voices, pace, gorgeous ‘The Newsroom’ rip off sig tune (is it ACTUALLY Thomas Newman?!) and clever use of music cues make this, well, very radio. It’s been criticised for looking busy (graphic-tastic) and too like Good Morning America. I’m not convinced that’ll be a deal-breaker for Sharon in Stoke. There are people who listen to the radio in the morning. And people who watch (or listen) to the telly. All the feverish press has been over the breakfast TV share and whether ITV can claw some back from Breakfast. GMB certainly makes the Salford set, with its inexplicable empty CGI meeting rooms, look poky and the whole pace SLOOOOOOOOOW. But if I was in an area with B-list breakfast teams, and I wasn’t bothered about music in the morning, Good Morning Britain would be a definite temptation – particularly on a busy news morning. “Wall-to-wall Eternal and M-peg2 Mpeggy sounding audio – and things crashing all the time,” is how launch presenter/programmer Keri Jones described the birth of Mix 96 to me. How’s it doing 20 years on? A furry, some people, a cake and a bouncy castle. My kind of part-ay. We’re mid-link with a bit of pedestrian show-prep-lite about a top ten of facial hair. PROMO: The Soundcheck Springclean puts you in control of the music we play. Sign-up. TRAVEL: “Not too much to shout about on the roads.” One route out of Tring mentioned and a plug for Jamline phone number. “What kind of creature is a budgerigar? A gherkin is a variety of what salad ingredient? And here is your clue.” (Clip of Happy Days theme). TRAVEL: “It’s lovely and sunny and lovely and quiet on the roads out and about in Buckinghamshire.” Not even a token road mention this time. And another plug for the Jamline number. ID: Darren & Katy at Breakfast (sung into bed): “Morning!,” opens Darren. “Morning!,” counters Katy. It’s her only word in this bit. “Hello!,” from Darren. “Welcome along to the show, Wednesday 16th of April it’s Darren and Katy here with all of the usual in the course of the next twenty minutes. 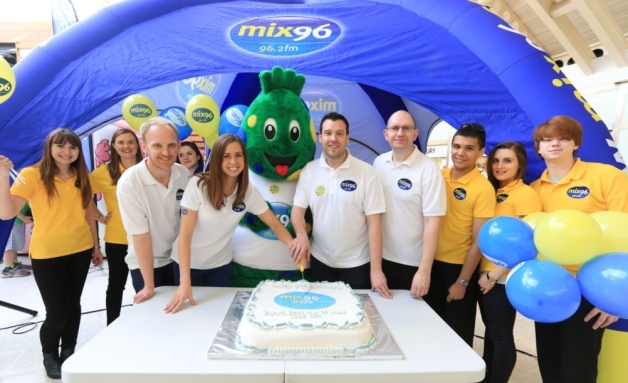 You know you could be £1000 richer, right, with the return of the Mix 96 thousand-pound minute. That’s to come, we’ve got Small Talk up next and James Blunt’s Bonfire Heart. The news and sport bulletin has four local stories, the lead with a strong quality clip. Chris is growly and newsy sounding. Katy, when she’s allowed on, sounds fun. But there’s an in-authenticity in some of the links though. Are the beard and YouTube bits content that the good denizens of Aylesbury could only wake up to on Mix 96? There’s no crime in using show-prep – but surely you have to make it your own. Is Darren REALLY so outraged at George Clooney? And that particular link could have been amputated at Katy’s “they just need to breathe,” which is at least an average punchline, and would have saved another minute of so of everyone’s lives. Traffic seems a bit thin. Do people in Aylesbury not commute? Two songs in twenty minutes seems a bit light, especially when tightening both loonnnnngggg links could have made room for another. Another week, another station that sounds like someone knows someone who heard Jack once, told them about it in the pub, and tried to recreate it without getting invoiced by Sparknet. Touching. 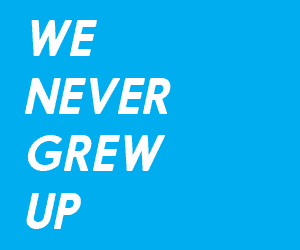 The new Touch FM strap line. April’s studying product design at uni. They have a chat about what she’s working on. There’s a bit of fake laughter going on. One of the whacky ideas April’s come up with is a pair of shoes with lasers in the toe “and if there’s any like object in the way that you don’t want to step in for example like you know something that a dog’s left behind, it lasers it out of the way, just annihilates it”. There are no rules in radio, obviously. But if there were, “Double-head male work best if there’s clear blue water between the characters,” would be one … Radcliffe & Maconie, Russ and Jono, Mayo and Kermode. Take two interchangeable same-age voices, both laid-back, cheeky-chappy, nice-enough, then never ident them individually (I’m Ollie, this is Si ..) it’s a struggle to find something tangible to engage with them as a twosome. Boy/Girl double heads maybe more of a cliché, and good luck to Touch for trying something different in the market, but straight away you’ve got delineation between the voices and an easier dynamic to latch onto. Aside from that, the music works for a Jackalike, although feels older than the banter. News and traffic cover the bases well. Although a travel centre, however new, still makes me think of somewhere I’m going if I want to buy a bus ticket. But the real issue for me here though is the selfie thing. As a mechanic, it’s Like-bait for Facebook. Maybe there’ll be some talkability around it (although that’s probably proportional to the sum offered, and £100 won’t buy you a lot) but what’s the on-air offer? The pixellation is laughable, so it’s pretty clear that if someone rings in, it’s them. So there’s no jeopardy there. There’s nothing to play along with on the air for a casual listener. The whole thing comes and goes without even any on-air production, tension bed etc. It’s all a bit – whatever. Oh, and is it just me? Female contributors being described as ‘lovely’ in 2014?? Two Jacks had a row. One changed his name to Bob. Here’s what happened when we listened in. ‘Bobalong’ (What’s On): Graham Mack voiced-up event for Magic of Play appeal at Lister Hospital. Well that started OK. The name might have changed but there was nothing new about the music going on here. Crowded House is archetypal Jack. Clever, guitar-y, under-played. Kate Bush was a (nice) surprise, and the kind of shufflesque curve ball the boy-name formats deliver. Then the wheels fall off. 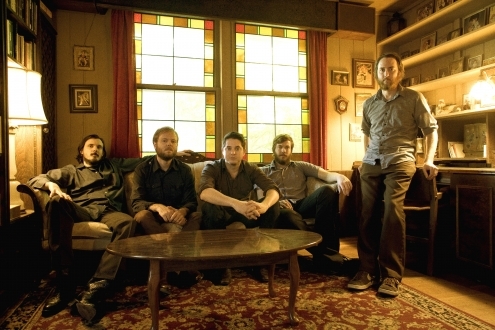 Midlake are a millennial Texan version of Mumford and Sons. Beloved beards of 6Music, but file under ‘trying too hard’ for a Jackalike. You could get away with that if there were bankers either side, but a Don Henley non-hit (a non-hit here anyway?). This was spicier than Mel B wearing Old Spice making a Vindaloo. Milake, wondering why they’re here. Good to hear Graham from Breakfast voicing the Jactivi- Bobalongs. Less impressive were the Jack-like liners. The Manchester United one was a good topical, but the rest were forgettable. Poor little Hertbeat. Its first name, extinguished when Global came to town, and its second face, forcibly removed by its franchisor. Let’s hope it’s third time lucky for 106.7/9. As another under-performing beyond-106 station jacks off, we listen in to the station where it all began. 96.9 Jack FM Vancouver. JACK TRAFFIC: Problems with a rollover crash in Surrey, another rollover accident in West Van on the upper levels, and VC Hydro say it will noon before several neighbourhoods will have power back ‘after an ice storm’ last night. ID: Jack’s Morning Glory with Kiah and Tara Jean – Staunch advocates of the belief that reading the fortune in your cookie should always be followed by the words ‘in bed’. “You lovely ladies are going head to head in the rapid fire trivia battle called No Time to Google,” continues Kiah. “It’s a best of three. You’ve each got five seconds to answer your respective questions and today the winner gets fifty bucks to spend at the newly opened, newly reopened Kings Head pub in Kits.” “Great.” “Awesome,” say the contestants, seemingly unconvinced. TJ starts the quiz. “Alright Michelle, you’re first and the clock starts at the end of this question. From Academy Award trivia ladies ..” “You’re kidding,” interrupts Kiah. “Yes!” “Uh-oh,” says Michelle, before answering correctly that Ellen De Generes was the host. Melinda gets hers wrong, thinking Gravity won Best Picture. Round 2. “Some math trivia ladies. What is 25% of 200?” Michelle stumbles around for the right answer. “25. 100. Sorry, 50! I know what it is.” Melinda correctly answers that 100 divided by 5 is 20. The music’s very Jack. There can be no more Jack tune than Centrefold, after all. And even though the fortune cookie line is a weak one, it’s good to see we’re exporting Paul Darrow back to the Canadians. But it was all a bit, safe, measured and – for, Jack, girly. TJ is definitely the lead-presenter here. Clearly Kiah gets top billing, because he’s the man, right? But in this 20 minute segment at least, Jack’s all dressed up like an unconvincing Jackie. Perhaps in its attempts to beat AC competition in the market, it’s all gone a bit ACDC. “The station formerly known as BRMB” arrived forty years ago. Free Radio has been celebrating this morning. Slightly rambly off the back, long goodbye, throw forward to Thousand Pound mechanic tomorrow. TRAFFIC: “Birmingham’s most accurate travel on Free Radio with Trust Group UK dot com. See their used car offer online or visit them in Redditch, Stourbridge or Wolverhampton.” M6 South at Spaghetti / Walsall accident / Trains back to normal at Kidderminster. 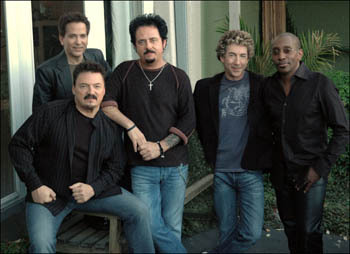 More Les Ross memories. “I won tickets to go into the cage on Tiswas on Les Ross’s show in April 1976.” They mention the Phantom Flan Flinger. Her husband also won the £10k birthday bonanza in 1998 and they went to New York and blew the lot. “Imagine Re Tuner man getting together with the Phantom Flan Flinger?” Laughs. So the four horsemen of the apocalypse DIDN’T come galloping down the Aston Expressway the moment the four letters that dare not speak their name were unscrewed from Oozells Square. You could call your heritage radio station ‘Giraffe Octopus Cushion’ if you like … if you get the content right, they will come. And this is a bright, confident, relaxed breakfast show. I’d have liked another song or two maybe. Everything could tighten a bit – there were 56” off Gail’s bird pooh punchline before the song for example – and are most double heads boy-girl for a reason? Easier to cast and differentiate, something for everyone? But clearly here Foxy and Guliano have an authentic off air friendship too. It’s a difficult tightrope on a morning like this one. Les Ross certainly got more coverage in this twenty minutes than the current incumbents – particularly Kiara, who’s notably absent from imaging, web pics etc. Les, legend though he is, DID leave 96.4 nearly 14 years ago now … despite making Many Happy Returns ever since. So last time we tried to listen to Heart Cornwall after its Ofcom wrist-slap. But we were fed the wrong station down the Global pipe. So here we go again. “Heart Drivetime, four minutes to five, how you doing? Are you well? Are you alright? It’s me, Victoria Leigh. I hope your day’s treated you beautifully. Listen, serious stuff for just a moment, we do have an amber weather warning in place tonight for Cornwall for strong winds and crossing control at the Tamar bridge are already reporting winds of over 50 miles per hour on the bridge. I’ll bring you a full travel report in just a few moments time, but please, please, if you’re travelling tonight. do take extra care. Ahhh, dear. Be springtime soon, promise, promise, promise, promise. TRAVEL: Sponsor Tag. Broken down bus at Cambourne, “a horse stable blown into the road” at Peter’s Hill, Tamar Bridge winds over 50mph, and on the A30 at Penzance, a fallen tree. DONUT ID: Now, more music variety. Heart. “Good Afternoon, how are you? Welcome to Heart Drivetime with me, Victoria Leigh. In this hour, we’re going to be playing the Big Town Showdown and I’ve got music on the way from Mark Morrison but we start with Avicii.” DONUT ID: This is Heart. “Mark Morrison, Return of the Mac. 11 minutes past 5. Welcome to Heart Drivetime, if you’re just joining us. Phew, weather’s getting worse, s’getting windier. Just had a call to say that at Truro Tractors, at Chacewater, there’s a tree down there as well now, it’s coned off so the road’s completely blocked. I’ll try and bring you more details as we get them. Please take care tonight, we’ve got a yellow weather warning in place, no an amber, sorry, an amber warning in place tonight for Cornwall for high winds so we’ve got, you know, severe gales, heavy scattered showers lows of 5 degrees. Please take extra care. Shall I tell you something that’s gonna make you feel a little, perhaps a little something to cling onto of days to come, of summer, of warmth, of spring, of nice stuff? Eden Sessions have announced this afternoon their second session – and it’s Dizzee Rascal?! Man! Some people think I’m bonkers. You probably are. Brilliant. Very good. See? In June. When the weather is warm and we can wear flip flops and drink cider and put our little dresses back on again. It will be warm, I promise you. Ellie Goulding then on July 8th, and Dizzee Rascal now on June 21st at the Eden Sessions. Huzzah. Stuff that’s happening in the Summer time. It will happen. And of course, let’s not forget, the first of the things happen (sic), a Summer Masked Ball at Porthleven. 3rd May. Groove Armada. See? Everything they do sounds summery. We’ll be alright. We’ll get through. I promise you. Promise we’ll get through. Well. Fourteen place name mentions in 20 minutes. Heart Cornwall just got a bit more Cornish. Victoria seems nice enough, even if occasionally you get the impression she’s being paid by the word. Look at that mammoth link off Mark Morrison. We’ve got a traffic flash, three what’s ons and a competition solicit! Where does warm cross over into patronising for you? Do you flinch when someone on the radio insists you take extra care, when with horizontally flying trees, “horse stables” and landslides happening around you, that would clearly be the best course of action? Not to mention the pissed-off seals. Who knew not to approach them? Every day’s a school day. Victoria’s slick into and out of the news. She even sounds genuinely interested in Who’s on Heart? Newsreader Andy makes a valiant attempt to do the same but can we just have newsreaders reading news rather than delivering web-solicits and promo reads? That tired old audience-confusing cliché of ‘producer talking to voiceover on talkback’ idea pops up on the Smoking cessation ad, which is already annoying enough thanks to bloody Brian Blessed. Followed swiftly by a Confused dot com ad for which the punchline is about a dog shitting on the carpet. Nice. Tunes are very Heart. As you’d expect. And I’d like to hear a little more about the real Victoria. Carrying an entire station’s localness on your shoulders leaves little enough room to be yourself, I guess. But this was one show sounding as local as it was useful.